From a performance and operational point of view, the LGB Knuckle coupler is hard to beat. On the other hand, they look big and clunky and only approximate the appearance of prototype knuckle couplers. This is your typical trade between form and function. The coupler is designed so that steady pressure with the knuckles open will not cause them to latch, but a light tap will close and latch them. This allows a cut of cars to be uncoupled at the location of an automatic uncoupling track section or where they can be manually reached and then pushed to their final location and left there. Unlike Kadee couplers, if the uncoupled couplers drift apart for some reason, they will not recouple again if rejoined lightly. LGB Knuckle couplers are very strong and will not uncouple by themselves as some other brands do. They can be uncoupled manually without difficulty (unlike Kadee's which are fairly difficult to manually uncouple). They mount easily on all LGB, Bachmann and MDC rolling stock and with minor modifications they will mount to Aristo as well. 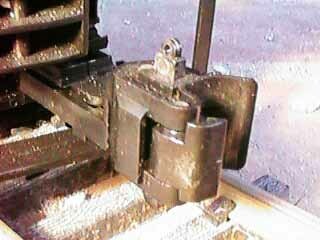 Mounting on Lionel can be a problem depending on which car or engine is involved but it usually can be done. One significant drawback, besides their terribly out-of-scale size, is their price. At about $5 each, they can be a significant investment. Other brands can be found cheaper, but none other works as well. LGB Knuckles and Kadee couplers manually couple fairly reliably and can be used together. No two other types integrate as well. Remote uncoupling requires an LGB 1056 uncoupling track. The portable manual uncouplers that can be used with hook/loop couplers cannot be used with the knuckles because the couplers will uncouple when dragged over them every time. Out of the bag the couplers typically don't work very well. They need just a little work before their true performance capability can be realized. This is the subject of this tip page. For the couplers to work properly, the latch pin MUST be able to drop freely and quickly as the couplers are tapped together. To allow this to happen, check out the suggestions below. There is a small circular mold mark on the side of the pin right below the top. This mark can be seen on the photo. Sometimes, this mark will allow the pin to hang up long enough to prevent proper operation. Clean off any protrusions with a small file. Burnish the pin. With the coupler knuckle held tightly closed, work the pin up and down to burnish the rubbing surfaces inside the coupler. Work the pin over and over until you can feel that it moves freely. Use graphite lubricant, NOT OIL, to lubricate all of the bearing surfaces of the pin, INCLUDING all the surfaces inside the coupler where the knuckle bears against the pin. While you've made a mess with the graphite, get your finger in there and work some of it around on the face of the knuckle and the palm of the body. There should be graphite on every surface of each coupler where it touches another coupler. It is important that there be minimal friction between the two couplers when they come together so that they can engage most deeply and give the pin the longest opportunity to drop before the knuckle spring presses them apart again. If you elect to paint the couplers, DO NOT paint the face of the knuckle or the palm of the body. Paint on these surfaces will add friction and prevent the couplers from working at all. While you are painting the top, close the coupler so that the pin drops and you won't get paint on the working surfaces of the pin. If you paint the bottom, which is unnecessary because you can't see it anyway, allow the pin to move upward so that the bearing surfaces of the bottom of the pin don't get painted. If you get it right, you will be able to couple a single lightweight car without the car bouncing off. Relubrication of the couplers may be needed periodically if they get a little stiff.